Chief Minister Parkash Singh Badal formally started his election campaign in the Lambi constituency this morning. 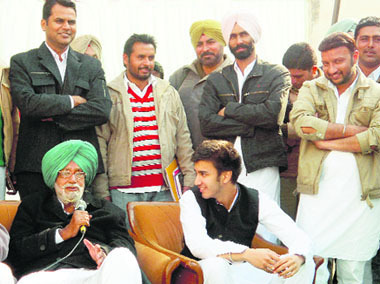 He is pitted against his younger brother Gurdas Singh Badal of the PPP. The SAD-BJP government did come out with a new industrial policy, but the flight of industry to other states could not be checked. A few ‘mega projects’ were launched too, yet there was little fresh investment worth counting Small and medium-scale industries need fresh impetus from investment in large industry that may anchor growth. Gurdaspur: The Congress high command is likely to announce three candidates from Gurdaspur parliamentary constituency in its first list. Gurdaspur District Congress president Sukhjinder Singh Randhawa, a former CPS, may be nominated from newly carved out Dera Baba Nanak seat. Senior SAD leader and sitting MLA from Anandpur Sahib Sant Ajit Singh today resigned from the primary membership of the party. He submitted his resignation to Chief Minister Parkash Singh Badal and also to SAD president Sukhbir Badal. The Congress youth brigade is to the fore in Majha region with Sukhpal Singh Bhullar, son for former Irrigation Minister Gurchet Singh Bhullar, deciding to throw his hat in the electoral ring from Tarn Taran assembly segment. Braving the bone-chilling cold conditions and extremely low visibility on a foggy morning, the inhabitants of sleepy Dharmheri village, one of the most flood-prone villages alongside the Ghaggar on the Patiala-Kaithal state highway, were busy in their daily work, when The Tribune team reached the village. Prime Minister Manmohan Singh will pay obeisance at the Golden Temple on January 1, 2012. Officials of the PM's security today took stock of the arrangements prior to his visit to the city. As per information, the Prime Minister would arrive in the city on Saturday night and pay obeisance in the wee hours of January 1 and fly back to Delhi the same day. The Department of Welfare of Scheduled Castes and Backward Classes was in news for good as well as for wrong reasons this year. Widening the scope of Shagun, scholarship and housing schemes by including beneficiaries from the economically weaker sections and minority communities and introducing the online transfer of grants directly into beneficiaries' bank accounts were the two steps that brought accolade for the Department. The Election Commission has ordered the transfer of Sharad Satya Chauhan, Commissioner of Police, Ludhiana, following allegations that he was helping the ruling coalition. The EC has sought a panel of three officials from the Home Department. One of them will replace Chauhan. 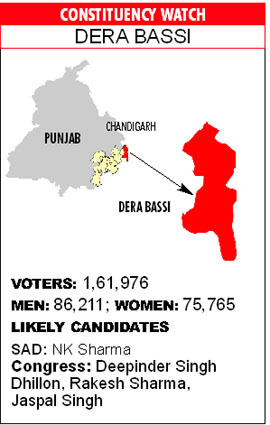 The changed geographical boundaries of the newly carved out Dera Bassi constituency (which earlier formed part of the Banur constituency), is expected to have an impact on the poll arithmatic of various parties. Post-delimitation, about 30 villages in the Verka constituency, 32 villages in Jandiala Guru and 11 in Amritsar West (these constituencies are considered Congress strongholds) have been attached with the Attari (reserve) constituency. The people are highly critical of Gulzar Singh Ranike’s performance. This, coupled with allegations of nepotism in the release of development funds, the three-time Akali MLA is bound to have a tough time retaining his seat. Muktsar, Moga and Barnala districts where candidates like Chief Minister Parkash Singh Badal, former DGP Paramdeep Singh Gill and former Principal Secretary DS Guru are in the fray seem “too hot to handle". Most officials are unwilling to be transferred to these districts. Keeping a close vigil on paid news in newspapers and the electronic media, the Faridkot District Electorate Office (DEO) has issued a show-cause notice to former Agriculture Minister and SAD Jaitu candidate Gurdev Singh Badal. The notice was issued after a news item in a vernacular media reported that the candidate had inaugurating several reverse osmosis treatment plants in Jaitu area. Following high alert and tight security measures at the Central Jail, Patiala, three persons were arrested for trying to throw a packet containing over 3,000 capsules and sedative powder inside the jail premises. An employee of a filling station on the Barnala-Ludhiana road was shot at by three persons this evening as he tried to stop them from looting cash. Chief Minister Parkash Singh Badal formally started his election campaign in the Lambi constituency this morning. He is pitted against his younger brother Gurdas Singh Badal of the PPP. Addressing a gathering at his palatial house in Badal village, an emotional Badal said he was an unlucky man having been separated from his younger brother and then losing his wife Surinder Kaur. “Heartbroken, I was unwilling to contest the elections, but the party’s order is supreme. I assure you to carry out overall development of the area,” the CM said, adding that Akali activists would have to canvass for him in the constituency as being the chief ministerial candidate, he would have to campaign in other constituencies. “Pradesh Congress chief Amarinder Singh is busy getting his ‘achkans’ stitched and CLP Leader Rajinder Kaur Bhattal purchasing silk suits. They have no other agenda except to have fun. But, I have worked like a daily-wager for the development of the state,” claimed Badal. He refrained from uttering a single word against his estranged nephew PPP chief Manpreet Singh Badal and his father. 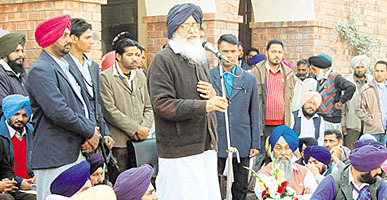 Badal appealed to the Akali workers to strictly follow the directions of the Election Commission of India (ECI). Before starting his campaign, Badal paid obeisance at the village gurdwara, temple and mosque. The famed Punjabi entrepreneur seems to be losing his magic touch. The spirit, however, was not lost for any want of will, but the business environment that could not provide sufficient reason for big investment to flow into the state. While the competition posed by neighbouring hill states owing to tax exemptions there remained a major disadvantage for Punjab, the state government, too, did not make a concerted political effort or provide fiscal incentives to industry. Even as the government during the past four years did “sanction” 91 mega projects worth Rs 51,049 crore, actual investment of only Rs 9,673 crore was made, according to sources in the state Industries Department. Besides these mega projects, investment of Rs 14,475 crore also came in the form of other large and small projects. 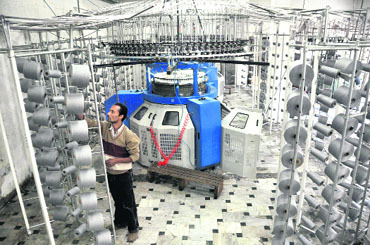 Small and medium-scale industries need fresh impetus from investment in large industry that may anchor growth. One of the major dissuading factors for industry was unavailability of land, its high cost and inordinate delays in getting clearance for “change in land use (CLU)”. And it’s not just investors from outside Punjab who chose to set shop in hill states, but even industrialists from Punjab sought to expand their operations in Haryana, Madhya Pradesh, Maharashtra and even Gujarat. Except the Rs 19,000-crore Guru Gobind Singh Refinery in Bathinda, there has been no large industrial investment in the state. The big industrial houses of Punjab — whether Vardhman Group or Trident Industries — too looked outside the state for expansion. They set up units in the tax havens of Himachal Pradesh and Uttarakhand, besides other industrial states mentioned above, as land is much cheaper there, and power availability is better too. No wonder, the contribution of industry in the state’s gross domestic product (GSDP) has been falling. The government claims that the contribution of the manufacturing sector grew 11.99 per cent in 2009-10, but the “growth” was seen largely because of very low contribution in 2008-09 due to the global recession. There is hardly any land available to set up big industrial units in the state. The government’s New Industrial Policy had promised a land bank would be created to offer the precious commodity at concessional rates to industry, the scheme failed to take off. Wherever land is available, it is very expensive. A recent Confederation of Indian Industry report noted the estimated cost of industrial land was $35.42 per sqare metre in Mohali, $7.71 in Ludhiana and $11.10 in Amritsar. External development charges and licence fee would take the cost in Mohali to approximately Rs 3.50 crore per acre. Though the government has a policy to allot land off the shelf, industrialists complain of lack of transparency in this scheme. The state’s attempts to create land pools in Kapurthala (260 acres), Ropar (300 acres near IIT), Rajpura (1,400 acres) and Bathinda (1,500 acres) too failed to take off. 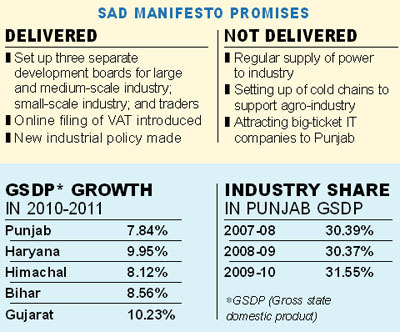 Unscheduled power cuts and mandatory days off for industry have been the norm in Punjab rather than exception. Combine that with severe shortage of skilled manpower, and there is no way to keep the wheels turning in even the existing industrial units in Punjab. Most industry in Punjab is power and labour intensive. In peak summers, there are long power cuts for industry, as the available power is diverted to the agriculture sector, essentially paddy. This increases the cost of production, as own power generation is very expensive for industrial units. For labour shortage, the National Rural Employment Guarantee Act is blamed, as a large number of workers that earlier came from Uttar Pradesh, Bihar, Jharkhand and Orissa have stopped coming as they get work back home under the Central scheme. The Akali-BJP government did realise the power problem, and worked on increasing generation, but failed to make sufficient power banking arrangements to ensure regular supply. The total generation capacity in the state today is 6,600 MW. The five years of this government’s tenure did see three new projects being sanctioned — at Talwandi Sabo (1,980MW), Rajpura (1,200 MW) and Goindwal (540 MW) — but it will be a while before these are commissioned. The state allows units to buy power under the Open-Access Policy, but industrialists say this is not really being encouraged by the government. The per unit cost of power (Rs 5.28) in the state is also among the highest in the country. Add to it the high electricity duty of 13 per cent, and the high VAT on diesel (used for captive power generation), and the industry sentiment becomes quite unfavourable. As for labour, incentives like higher wages, mobiles, and better living quarters too have failed to attract workers. Exploit the state’s rich agriculture and textile base to attract related agro-processing industries. Focus on better synergy between agriculture and industry for food-processing, dairy and textile units, as the raw materials are readily available in Punjab. To overcome high land prices, create multi-product Special Economic Zones (SEZs) on the land pools proposed at Rajpura, Ropar, Kapurthala and Bathinda. Invite textile, IT, agro-processing and auto component units by offering land at reasonable prices in these SEZs. Investors should be assured of regular power supply in these SEZs. Till the state’s own generation becomes sufficient, the government could woo investors with subsidised diesel (by reducing VAT) for captive power generation. To make skilled manpower available, there is need to upgrade the existing Industrial Training Institutes (ITIs) by arranging direct industry-ITI linkage. The curriculum needs to meet the present and future industry needs. The change-of-land-use permissions to set up units will have to be quicker. More transparency is required in the allotment of sheds at various industrial focal points under the “off-the-shelf allotment” policy. With the oil refinery coming up in Bathinda, the government could create a petrochemical hub in the area. Industrial corridors can also be created along the dedicated rail freight corridor, and the state must work for its extension to the Attari border to aid exports to Pakistan. Rejuvenate small and medium enterprises (SME) in auto components, garments, leather and hand-tools industry. For this sector to prosper, the need is to attract a big automotive manufacturer to act as an anchor for the existing smaller units. 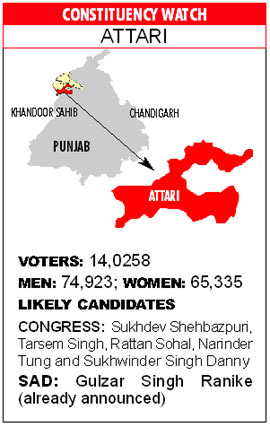 Sant’s resignation a few weeks before the assembly poll is a setback for the SAD in the Ropar belt where he commands a considerable hold among the electorate. He is a popular leader of the Saini community as well. Sant Ajit Singh said he was feeling “suffocated in the party as senior leaders were being humiliated and sidelined”. He said he had even brought the matter to the notice of Badal “but to no avail”. Having come to limelight after the death of Sant Harchand Singh Longowal in the mid 1980s, Sant Ajit Singh said he would not join any political organisation but would campaign in support of “like-minded”candidates. Patiala: Two Akali dissidents in Patiala have announced to contest the assembly elections as Independent. Balwinder Singh Saifdipur, vice-president of the Akali Dal, has revolted against the party's decision to field Harpreet Kaur Mukhmailpur, wife of SAD Patiala president Ajaib Singh Mukhmailpur, from the Ghanaur Assembly segment. Saifdipur said he was left with no other option but to contest the election as an Independent candidate. Elected recently as the Punjab Youth Congress vice-president, Bhullar along with his supporters is camping in New Delhi where hectic parleys are going on between senior AICC and Punjab Pradesh Congress Committee (PPCC) leaders over the distribution of ticket to prospective candidates. Bhullar is staking claim from a predominantly Akali seat. In the seven assembly elections held since 1977, the Congress has won the seat only once in 1992 — Dilbagh Singh triumphed — when the Akalis boycotted the polls. A senior Congress leader revealed that Sukhpal was banking on the fact that if the Congress decided to field a young and fresh face from a seat where the Congress had always been on a weak wicket, Bhullar may get the nod because he had been working among the masses for the last several years. “Moreover, there is a 32 per cent Jat Sikh vote bank in Tarn Taran, which will work in Sukhpal’s favour,” he claimed. “Sukhpal is being backed by a powerful lobby in the Congress, which wants to counter the growing influence of SAD Youth wing president Bikramjit Singh Majithia. Even if he does not get the party nomination this time, the Congress will use him to counter Majithia, particularly in Tarn Taran, Khadoor Sahib, Valtoha, Khem Karan and Patti,” claimed a former Minister. Sukhpal’s father Gurchet Singh Bhullar has remained an MLA from Khem Karan, which also falls in Majha region. Braving the bone-chilling cold conditions and extremely low visibility on a foggy morning, the inhabitants of sleepy Dharmheri village, one of the most flood-prone villages alongside the Ghaggar on the Patiala-Kaithal state highway, were busy in their daily work, when The Tribune team reached the village. A hot debate over the coming Punjab Assembly elections was on in the village that suffered a lot of devastation during floods in 2010. When asked about the most important election issue, the villagers, most of them middle-aged, said in unison, "Hansi-Butana canal and the under-construction wall. We have suffered a lot on account of floods and this time, we would not cast our votes to the ruling SAD-BJP combine on account of their utter failure to find any solution to the problem." Notably, the matter pertaining to the construction work of the 3.75-km toe-wall, alongside the Hansi-Butana canal embankment, is a burning issue among inhabitants of hundreds of villages, falling in the jurisdiction of the Shutrana, Samana and Ghanaur assembly segments of the Patiala district. Opposing the construction of the wall, SAD-BJP government had approached the Supreme Court but couldn't get stay on the construction work. Mohinder Kaur and Shimla Devi, both residents of Sassi Gujaran village, while narrating the tale of woes of the affected villages, said that the SAD ministers and senior leaders had promised to get the matter resolved and hogged media limelight, but nothing had been done to end the woes of the aggrieved villagers. Because of the floods, villagers not only suffered financial losses on account of crop damage, but their houses developed cracks, cattle died, humans suffered from various health ailments and finding good match for youth became extremely difficult, the duo said. A visit to nearby villages, including Hassanpur, Sassi Thay, Mangata, Ramnagar, Nawagaon and Sassi Brahmana, brought to light that it was the same story for everyone residing alongside the river Ghaggar. "Before taking any final decision, we will call a meeting of all the flood-prone villages and make a consensus to vote against the present government", said Avtar Singh, a septuagenarian from Dharmheri village. Expressing his views, Sukhchain Singh of Haripur village said, "When former Chief Minister Capt Amarinder Singh kept insisting that the state government should approach the Punjab and Haryana High Court to get a stay on construction of the toe-wall, then why the SAD-BJP government failed to explore that option." 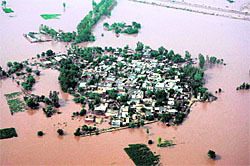 Though the Ghaggar, known as the river of sorrow, has been bringing misfortune to several areas in Patiala district in the form of floods from the past more than a decade, but experts in the Punjab Drainage Department are of the view that construction of the Hansi-Butana canal had aggravated the problem. According to the Punjab Irrigation Department reports after 2010 floods, Haryana started the work to strengthen embankment of the Hansi-Butana canal by constructing a toe-wall. The wall would ensure that there is no breach in the canal, in case Ghaggar river overflows and water from Punjab side hits Hansi-Butana canal. This would though save Haryana, but would leave hundreds of villages of Patiala and Sangrur flooded. Security has been tightened in view of the proposed visit of the Prime Minister with more police force being requisitioned from neighbouring districts, including Gurdaspur, Batala, Amritsar (Rural) and Tarn Taran. More that 1,500 police personnel have been deputed to guard various religious places where he is likely to visit. Sources said that Gurdaspur police has been entrusted with the security arrangements near the Golden Temple, while Tarn Taran police would guard the Durgiana temple. The whole route and circuit house would be guarded by the Batala and Amritsar (Rural) police. Moreover, the SPG teams today conducted mock exercise on the proposed route to be taken by the Prime Minister during his visit to the Golden Temple and the Durgiana temple. At the same time, the department faced criticism for not being able to provide scholarships, as the Central government had refused to release the funds after the state government could not utilise the last year's grants under the centrally funded schemes. As many as 17 important welfare schemes, out of 62 were covered under the online system. These schemes included pre-matric scholarships for students belonging to parents engaged in unclean occupation, OBCs and minority communities, post-matric scholarships for students belonging to the SCs, OBCs and minority communities, attendance scholarships for SC girls in primary classes and shaguns and houses for homeless SCs. With introduction of online system, the grants started crediting directly into the bank accounts of the beneficiaries. The step was taken despite opposition from leaders in cities and villages. With introduction of the system, the leaders could not hog the limelight, as earlier they used to carry the cheques to the beneficiaries that used to take as long as six months to reach them. The department was also in news for the wrong reasons too. During last fiscal year, the department had identified 72,000 beneficiaries under the Shagun scheme. During this year, when they were digitising records of the beneficiaries, it was found that nearly half of the beneficiaries were fake and did not exist. An inquiry was ordered, which has not been completed so far. Moreover, the department could not pay any money to the beneficiaries under the Shagun scheme this year, as the Central government did not release the grant after the department failed to utilise last year's grant. The CEO, Kusumjit Sidhu, has asked the state government to withdraw the additional charge of Local Bodies Department, Patiala, given to the Superintending Engineer of Mohali recently. It is likely that the Senior Superintendent of Police, Fatehgarh Sahib, RS Khattra, may be transferred too. Khattra has stated that his son Satbir Singh will be contesting as an Independent. The Additional CEO said the EC had asked the Ministry of Broadcasting and Information whether PTC should be allowed to be aired or not. Meanwhile, the ECI has deferred the auction of property and draw of lots for plots. Wife of former Principal Secretary and a candidate from Bhadaur in Barnala, Dr Ranjit Kaur, posted at the Sector 16 General Hospital here, has been forewarned against canvassing for her husband. Similarly, ADGP Mohammad Mustafa has been asked to stay away from the poll campaign of his wife Razia Sultana, sitting MLA from Malerkotla. The poll code does not allow public servants to canvass for a candidate. The EC will not take action against Bathinda MP Harsimrat Badal for asking schoolchildren to vote for the SAD. “She spoke much before the poll code,” said Additional CEO Usha Sharma. The voters of this constituency elected Shiromani Akali Dal leader Capt Kanwaljit Singh for three terms before his demise and then his son Jasjit Singh Bunny in the subsequent byelection. With the Banur area merged with Rajpura after delimitation, it will not be a cakewalk for the Akalis this time. The Shiromani Akali Dal is almost decided on fielding NK Sharma from the constituency. Sharma will have to counter the anti-incumbency factor. Also, there is discontent among supporters of Capt Kanwaljit Singh’s family. The local Congress unit is riddled with factionalism. 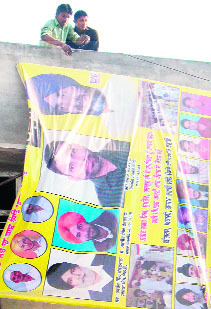 There are several ticket aspirants opposing Deepinder Singh Dhillon, who has been working in the area for the past few years. NK Sharma claims to have carried out a number of development works in Dera Bassi area prior to his shifting base to Mohali. Ahead of the elections, Sharma has shifted his base back to Mohali after he faced rebellion from Shiromani Akali Dal leaders. It is a known fact that to neutralise the influence of Shiromani Akali Dal stalwart Capt Kanwlajit Singh in the area, Sharma was brought in by the Shiromani Akali Dal leadership. The Congress has been changing its candidate each election. A large part of Banur included in the Rapura and Bhabaht areas of Zirakpur now form part of the Dera Bassi Vidhan Sabha seat. PROJECTS: No effort has been made to repair damaged village link roads and provide a flyover at Dera Bassi. The residents of Dera Bassi and Lalru are unhappy with the Shiromani Akali Dal for not doing anything to contain industrial pollution. The work on laying of sewerage in Zirakpur has been going on for the past almost two years. No effort has been made to upgrade amenities in the illegal Zirakpur colonies. VOX POPULI: Congress leaders say that most of the development projects in the area have been carried out with Central funds. Infrastructure development has not been a priority with the government though a large part of Zirakpur is located along the Chandigarh-Ambala section of the national highway. A majority of residents in urban areas want better civic amenities. PROJECTS: Ranike claims to have spent more than Rs 400 crore on various development works in the constituency besides giving due attention to the newly included areas. Yet, he has totally failed to impress the voters that voted him to power for three terms in a row. Ranike says he got five power stations in the constituency upgraded besides laying link roads measuring 140 km. However, a majority of works that the sitting MLA claims credit for have been done under various Central Government schemes. VOX POPULI: Being close to the Indo-Pak border, most areas in this constituency are yet to see development.The sitting MLA has failed to initiate any major project for the development of the border areas, say residents. A sole dilapidated bridge in Rattan village connects a dozen villages with the city. In a state of utter neglect, the bridge has become accident-prone. The residents allege that the MLA gave grants only to sarpanches close to him who further used the grants for their own works. “The grants issued to various villages in the constituency were embezzled and never put to use for developments works,” says Gurdev Singh, a former government employee who was instrumental in getting a fraud case registered in this connection. Drug addiction is rampant in the constituency and no efforts have been made to wean away the youth from this menace. No initiative has been taken to bring a major project to the constituency to generate employment. No new government school or hospital has come up in the region. “We are keeping our fingers crossed. It is a tight-rope walk for us,” said an official here. Another official posted in Sangrur district said: “Knowing that the Election Commission is keeping an eagle’s eye on these constituencies, we feel rather uneasy. If an official is transferred on EC orders, it shakes his confidence. Fellow colleagues start looking at him with suspicion,” he explained. The EC recently transferred the Muktsar SSP and DC. In the past two days, two officials posted as Returning Officers (ROs) at Lambi were transferred one after the other. The Moga SSP was transferred two days ago and 20 SHOs were moved out of Moga yesterday. Meanwhile, Usha Sharma, Additional CEO, has warned that strict action would be taken against ROs who have not yet joined their places of posting. On former Gidderbaha RO’s plea for medical leave, CEO Kusumjit Sidhu has asked for a medical board report. Knowing that the Election Commission is keeping an eagle's eye on these constituencies, we feel rather uneasy. If an official is transferred on EC orders, it shakes his confidence. Fellow colleagues start looking at him with suspicion. To check the use of unaccounted money and liquor by various political parties and their supporters, the police has tightened the noose by erecting nakas on all entry and exit points of various towns. In Faridkot, the police has put over 20 nakas. Additional jail superintendent Rajan Kapoor said that security had been stepped up following intense fog and today morning, a sentry posted near a gate raised an alarm when some miscreants tried to throw a packet over the jail wall. "We have arrested Lahori Gate residents Soni, Mintu and Monu, while two of their accomplices managed to escape from the spot", Kapoor added. A case under the NDPS Act has been registered against the accused persons at Tripuri police station. Meanwhile, jail officials further carried a search inside the barracks.